Israeli police expelled worshippers and closed al-Aqsa Mosque for four hours on Friday. At least 40 Palestinians were injured and 20 arrested. Fully armed Israeli police officers raided al-Aqsa Mosque in Jerusalem’s Old City following Friday prayers on July 27, 2018. Israeli forces then forcibly expelled worshippers from the compound and closed its gates. About 40 Palestinians sustained injuries from rubber coated steel bullets, tear gas and sound grenades, which Israeli forces shot in the compound. Israeli forces arrested over twenty Palestinian worshippers, including seven children, according to the Wadi Hilweh Information Center. Palestinian witnesses and officials of the Islamic Waqf attest that Israeli forces attacked worshippers for no reason and without warning. 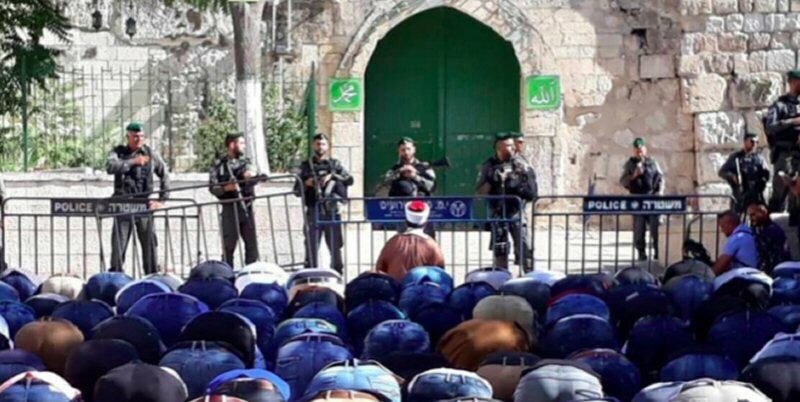 After expelling worshippers from the Mosque, Israeli forces closed the gates to al-Aqsa and stationed in front of them. Palestinian religious figures, politicians and local movements called on Palestinians hold prayers outside of the gates until they were reopened. Hundreds gathered there, mainly in the square of Bab Isba, and collectively and peacefully prayed there. Following the peaceful protest, Israeli forces opened al-Aqsa’s gates, which had been shut for four hours. Hundreds of Palestinians streamed back into the compound, chanting and singing. This development was considered a victory for the Palestinian popular movement. It reminded the people of last year, when Palestinian peaceful protests forced Israeli authorities to remove metal detectors around al-Aqsa. The Ministry of Foreign Affairs and Expatriates condemns in the strongest terms the heinous crime committed by the occupation forces and its police at the al-Aqsa Mosque today… This aggression comes within the framework of the escalation of the occupation and its settlers… [in terms of their efforts] to institute a special and temporal division [of al-Aqsa]. The silence of the international community regarding the violations of the occupation against Jerusalem and its holy and Islamic sites, especially the Aqsa Mosque, has reached the point of complicity. It expresses a grave disregard by the international community for the suffering of the Palestinian society. The Jordanian Islamic Waqf is responsible for maintaining al-Aqsa’s “status quo,” an agreement reached between Israel and Jordan following the 1967 Israeli occupation of Jerusalem. It stipulates that al-Aqsa is reserved for Muslims worship, though people of other religions may visit the holy site. Palestinians and Waqf officials have long warned that Israeli settler and police incursions are a step toward unilaterally changing the political status quo of al-Aqsa and occupied Jerusalem. Ahmad Jaradat is Senior Project Coordinator of the Alternative Information Center.